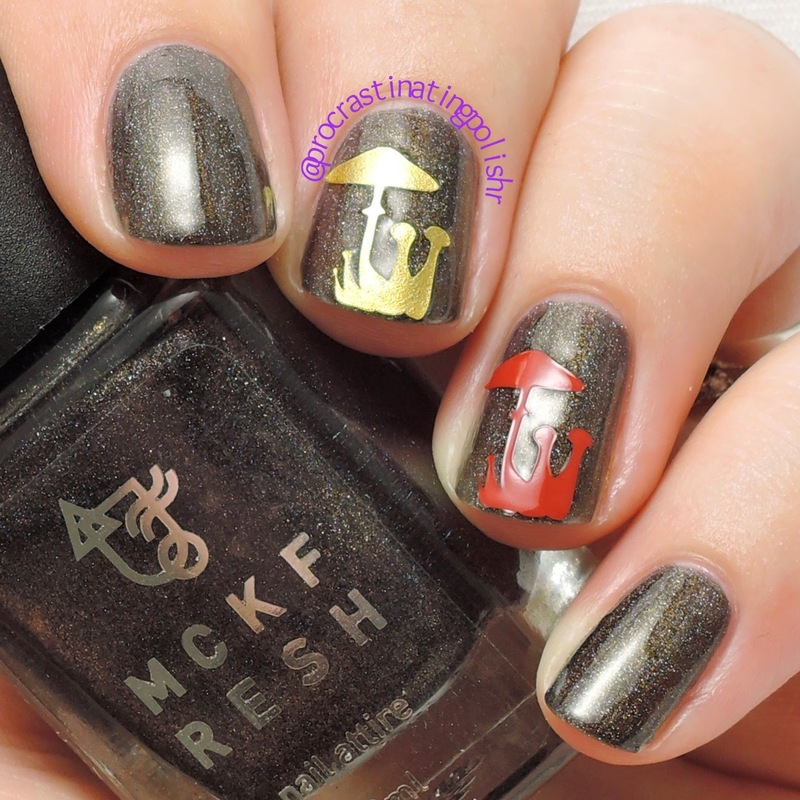 Today I have some really fun stuff to show you - the new nail decals from Mckfresh! These are not your run of the mill chevrons, straights or basic shapes either - they're totally kooky and completely unique. After the jump you'll find more pics and some application tips, so read on! I feel pretty confident in saying these are the only decals that come in 'Shrooms'. Currently available in gold and black, these are the strangest and most brilliant decals I think I've seen. These absolutely will not be to everyones taste, but I they are so bizarre and adorable I fell in love with them. They are quite delicate so some care is needed when separating from the sheet but my clumsy hands managed perfectly well. I've used them over a base of Oz. The first thing I think of when I see an Ankh is a 90's PC game called Commander Keen. Remember that game? No? Well you're missing out because it was awesome! ... Anyway. The Ankh decals themselves are also kinda 90's teen goth, hence I've paired them with some black nails (Sinister Midnight, coming soon!) and Glowing Posies. Bonus points if you keep the inner cutout, you get some cute little tear drop shapes. Little graphic diamonds have been huge over the last few years, most frequently found tattooed on knuckles or behind 20-somethings earlobes. Well now you can wear them on your nails too without worrying about your striping skills! I found these to be a little tricky due to all the cutouts. My tip: pick all the little cutouts out with tweezers before removing the decal, I stupidly took the whole thing out at once and ended up losing too much stick by holding on to it while picking the bits out. They are also a little wide so if you have particularly narrow nail beds (like my pinky/ring) they may not be a great fit. I can't imagine a thumb they wouldn't fit on though. I'm wearing one over Horrorland. Finally my favourite of the bunch is this amazingly detailed elk head. 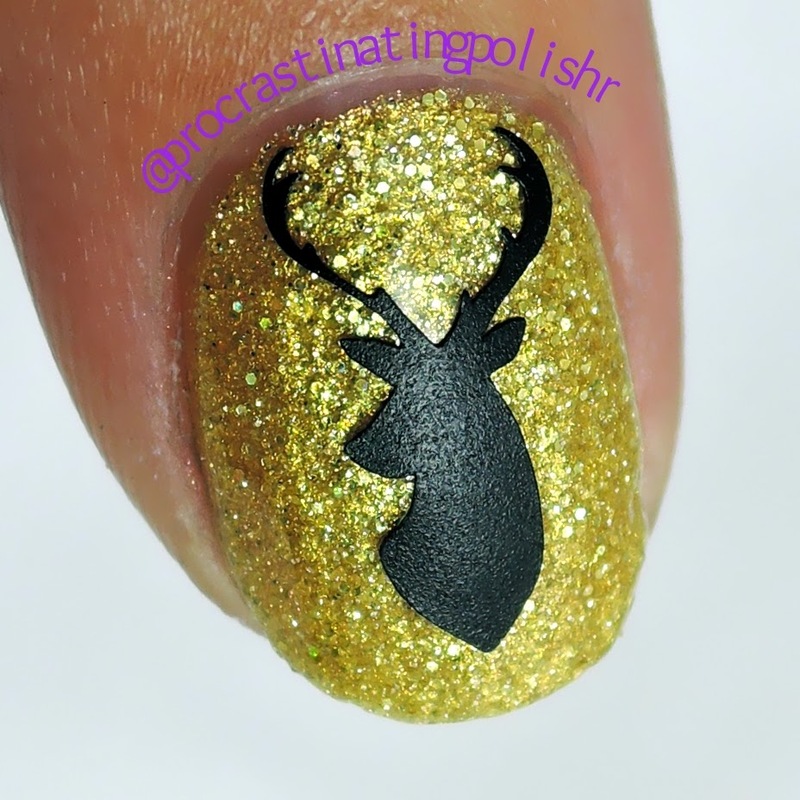 I've worn this without top coat specifically so you can see the detail in the antlers, I was so impressed! The black decals all had a slightly matte finish that I loved as well which is why the surface appears a little rough - it's not anywhere near as visible to the naked eye. The elk is worn over Mckfresh Ra! Ra! Ra!, which you will see later this week. All except the diamond can easily be used as a stencil as well, so there is some serious value for money! Use tweezers and be gentle! Use tweezers to remove any cutouts before removing from the backing, this will avoid unnecessary touching of the sticky side. For the best wear, place with tweezers onto touch dry nails. Once you are happy with placement press down gently and ensure the edges are secure. Always, always, always use a fast dry top coat (ie. Peita's Polish, HK Girl, Seche Vite). Slow drying top coats are more likely to cause the vinyl to bubble, shrink or warp. You can also use vinyl decals with lamp cured gel polish. If you don't want to top coat, place the vinyl over the top of your fast drying top coat. This will ensure it stays put for as long as possible. All four of these decals are now available here at Mckfresh Nail Attire for $2 per sheet (10-12 per sheet) + $2 postage for up to 6 sheets. No additional postage charge if buying with polish. 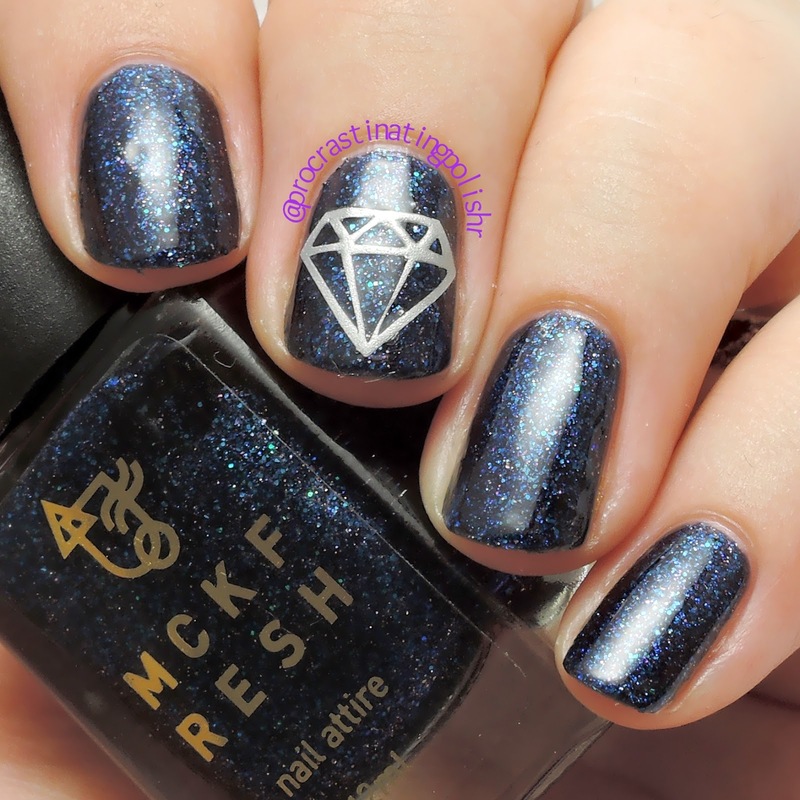 Later this week there will be more from Mckfresh - if you like glitter, stay tuned! 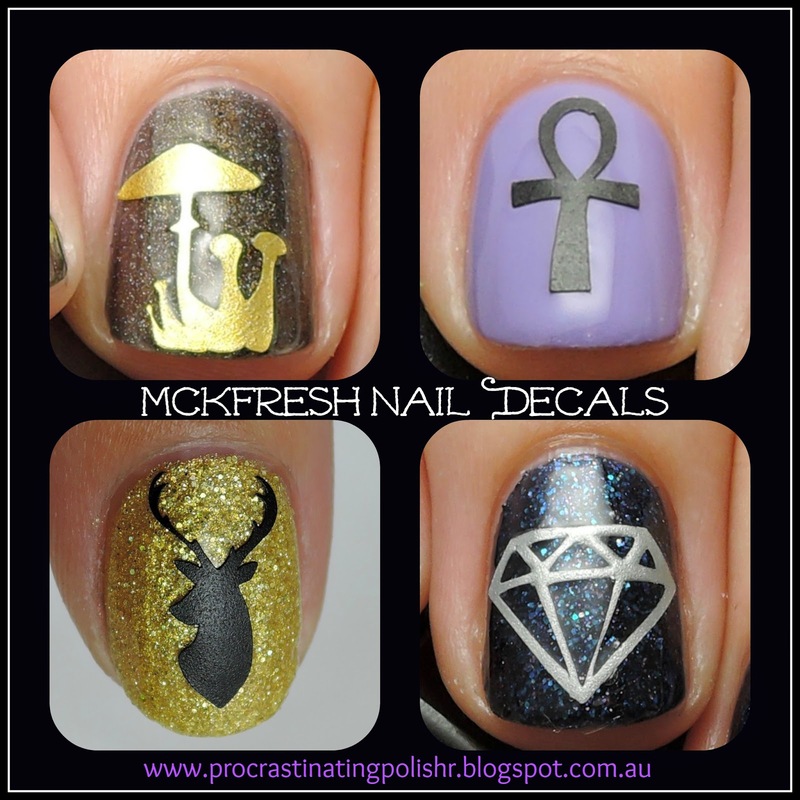 *The abovementioned products were provided by Mckfresh Nail Attire, which in no way affected my opinion of the product. Please refer to my Disclosure page for more information.